The jCOM.J1939.BT gateway is a high-performance, low-latency, wireless vehicle network adapter for SAE J1939 applications. It allows any host device with a Bluetooth COM port to monitor SAE J1939 data traffic and communicate with the SAE J1939 vehicle network. An SAE J1939 cable, suited for a 9-pin Deutsch connection, is included with the gateway. 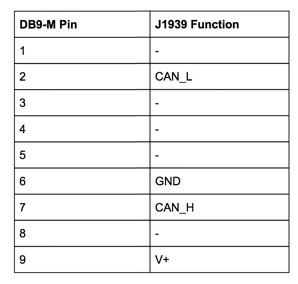 The gateway supports the full SAE J1939 protocol according to J1939/81 Network Management (Address Claiming) and J1939/21 Transport Protocol (TP). It is also supported by an extensive programming interface for Windows and Linux/Ubuntu applications, including full C/C++/C# source code for short time-to-market developments. The strength of the gayteway lies in the fact that the entire SAE J1939 protocol, including all timing requirements, is stored on-chip, thus taking the burden off the main system. The board uses a wireless Bluetooth COM port to communicate with the main system, i.e. all data transfer is handled through a standard COM port access. The communication protocol between the board and the main system is well documented and thus allows a porting to any computer system with a Bluetooth connection. Working source code libraries exist for Windows (C# under Visual Studio 2102/2013), Linux and its derivatives (C++ using Code::Blocks), and Raspberry Pi (C using the standard gcc compiler). An Android application with Java source code is in preparation. Please feel free to contact us for more information. With all its features, the jCOM.J1939.BT gateway allows the simulation of an SAE J1939 ECU (Electronic Control Unit) using embedded solutions such as the Raspberry Pi, BeagleBone, Arduino, Teensy, and others but also PCs running Windows, Linux (incl. Ubuntu, Fedora, etc. ), Android, or iOS. The communication protocol between the gateway and the host system (PC, Embedded System, Android System, etc.) is well documented, and we provide C source code to read and write CAN data frames. In addition, the gateway is supported by our jCOM1939 Monitor, an SAE J1939 Monitoring, Analyzer and ECU Simulation software under Windows. 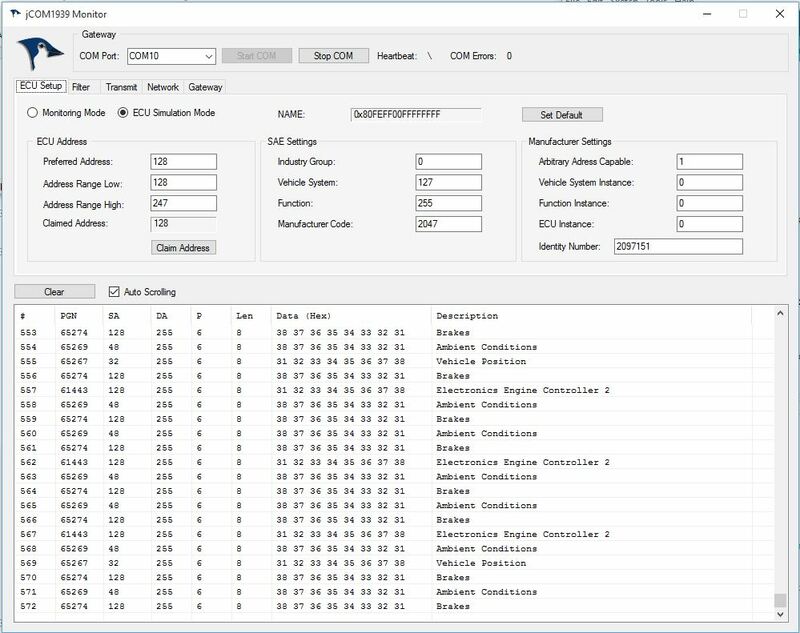 The jCOM1939 Monitor Software is the perfect tool to monitor, analyze, and simulate SAE J1939 data traffic. The system combines a powerful monitoring software with our jCOM.J1939.BT that functions as an SAE J1939 to Bluetooth gateway. A comprehensive and easy-to-use, easy-to-understand Windows software displays not only SAE J1939 data traffic; it also allows to scan the network, simulate an ECU (incl. full node address negotiation features), and respond to data request messages. 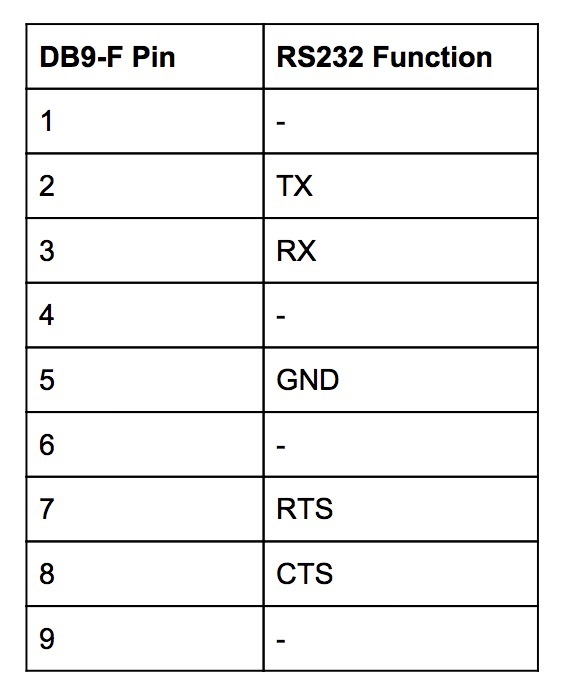 Details of the RS232 and CAN ports are described here. The RS232 interface is used for on-site firmware upload. We are working in enhancements of the firmware functionality and we will post updates of the firmware on this product page. RTS and CTS are not connected. CTS is always held in the ready state. The CAN port has an on-board 120Ω (0.5W) termination resistor. This termination resistor can be connected or disconnected via an on-board slide switch. The jCOM.J1939.BT gateway comes per default with a 120 Ohm termination resistor activated. To deactivate the resistor, open the enclosure and locate the DIP switch as indicated in the following image. Note: Due to the fact that this is a new product, there are no firmware updates available at this time. Also, you will need a USB-to-RS232 adapter to connect the module to your PC. Any standard adapter will do, but we also recommend using a standard straight RS232 cable, since these adapters use hex screws that collide with the RS232 port. The FLASH command button will set the gateway into programming mode, meaning it will cease its regular operation. The only way to resume regular operation is to reset the device per power-cycle (off-on). This feature can be used to load firmware updates into the device. Please check this product page frequently for possible updates. 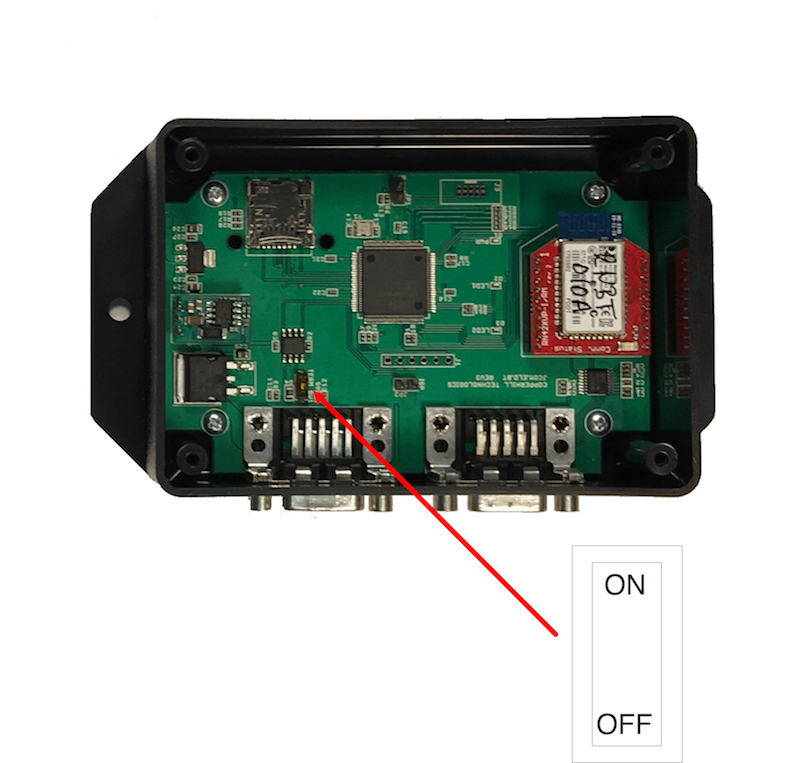 Click the button below to add the SAE J1939 to Bluetooth Gateway With 9-Pin Deutsch Connection Cable to your wish list.